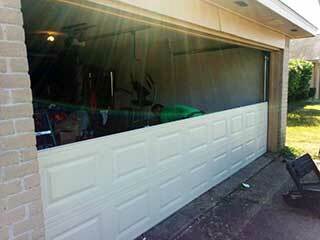 There are plenty of things that can go wrong with a system as complex as your automatic garage door. From misaligned safety sensors and a malfunctioning opener to broken panels, our technicians can handle any and all problems your system may be experiencing. Over time, the torsion or extension springs that keep your door moving smoothly will begin to wear out. They’ll give off warning signs as they begin to weaken, typically causing your door to sag or wobble as it moves. Torsion springs tend to start squeaking as well. If your door is exhibiting any of these signs, contact our technicians immediately. It can be dangerous to let these units fail, so arranging for professional spring replacement is essential. Do not be tempted to work on these components by yourself, since they’re under a huge amount of tension and can easily injure untrained personnel. The metal or wooden parts of a garage door can pick up dings, dents or cracks more easily than you’d imagine. These can detract from the door’s curb appeal and even inhibit its performance, so such issues should be repaired whenever possible. Our team will work fast to remove any dents we find, and even perform a complete panel replacement if some sections prove to be beyond repair. Your garage door tracks can also accumulate dents, as well as bends, which can cause the rollers to get stuck or even pop out. When that happens, our team can quickly realign them and return the door to its proper shape in no time at all. We don't just repair these systems, we install them too. Few homeowners realize how much choice they have when selecting a new door, but there’s a huge range of options for you to choose from. We provide everything from beautiful faux-wood to steel and aluminum door models from major brands like Clopay, Amarr and Windsor, and we'll be happy to consult you on which model offers the best insulation and curb appeal for your specific needs. Once you’ve decided on the perfect unit for your home, our technicians will carry out the door installation process and thoroughly test the system out afterwards, which is essential to ensure smooth operation from day one. For a comprehensive repair service provider that can handle any problem, contact Garage Door Repair Fleming Island today. Our technicians are always ready to help with whatever you may need, whether it's cable replacement, spring adjustment or any type of opener related problem.